This joke is completely not dated. It's not like this was the joke I had planned to do when "Fighting is Magic" was cancelled, just before the hiatus, and I've done it now anyways because I think it's still funny. "We worked really hard these last two years to built them!" It's still a cool reference though, even if Fighting is Magic was cancelled. So relevant to our time!! A nice place to play arena hoofball X. Twilight Sparkle uses Furious Glare! It's super effective! This page is full of AWESOME! Don't care if the joke feels dated, which it isn't, it remains good. Oh, Fighting is Magic... You shall be missed. LOL! mejor tarde que nunca. Hey Fadri, I don't want to be that annoying guy who asks what font you use in the webcomics, but... What font do you use in these webcomics? LOVE the FIM joke, thank god you can still get the game. Harshwhinny, you have forgotten I am one of the most powerful ponies in Equestria. Sorry,ATHEWM has ended forever. I"m going to kill myself. Well Raptor it IS that time again. ¿Alguien sabe que tipo de fuente es la que usa para estos comics? Are you guys gonna make any more? I've been waiting for MONTHS for some new strips! I think we can expect more when the new season starts, right? But you could control all those magic sparks you spammed at me before shielding and teleporting behind me, couldn't you, OVERPOWERED-AI-LIGHT! TWILIGHT SPARKLE MY SIS IS GONNA GET MAD AT U !!!!!!! I... Can't... Control it! AAUUUGGHHH!!! Congratulations! 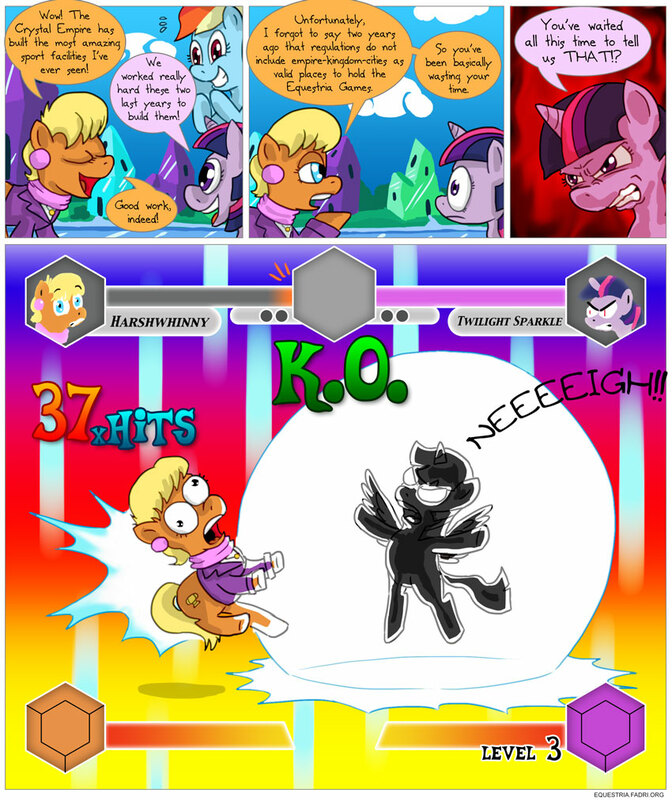 Princess Twilight Sparkle wins!